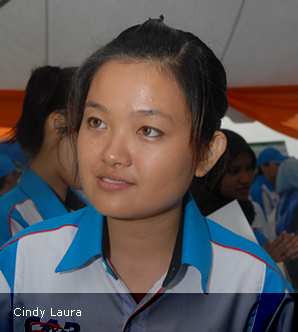 BANGI, 12 July, 2010 – A cartridge of liquefied petroleum gas (LPG) can drive a prototype car for 479.5 km – a feat achieved by UKMCAR2 which was adjudged the winner in its category in the Shell Eco-Marathon Asia 2010 which was held last Saturday. The team of third year students from the Faculty of Engineering and Build Environment, Universiti Kebangsaan Malaysia (UKM) won the Category for Fuel Gasoline at the Shell Eco-Marathon Asia. They won on their first attempt participating in an international competition involving 81 teams from 10 countries. The UKM students walked away with US$800, a trophy and a certificate leaving far behind them their nearest rival, The Exia Team from Bandung Institute of Technology, Indonesia. The Indonesian team used the same amount of ethanol gas as fuel but only managed to cover 133 kilometers. Besides UKM the other teams competing are from Universiti Teknologi Malaysia (UTM), Universiti Malaya (UM), Universiti Teknologi Mara (UiTM), Universiti Sains Malaysia (USM), International Islamic University (IIUM), Universiti Malaysia Pahang (UMP) and Universiti Malaysia Sabah (UMS) while the foreign teams includes students from universities and polytechnics in Singapore, Indonesia and Thailand. However half to the teams failed the first round of test which includes strength of cars while others failed to complete their rounds at the Sepang Circuit. 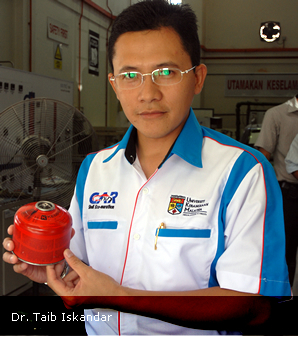 UKMCAR2 advisor, Dr Taib Iskandar Mohamad, said competition was stiff especially from the Indonesian. The designers of UKMCAR2 started their project since middle of April and worked from 10 am to 12 midnight for two months to produce an aerodynamic car using computer. They make use of a specially designed cartridge of LPG produced by Shell costing RM500 each. Similar ones are usully used for camping purposes. Team manager, Cindy Lora Sagan, said team spirit and had work brought them success. 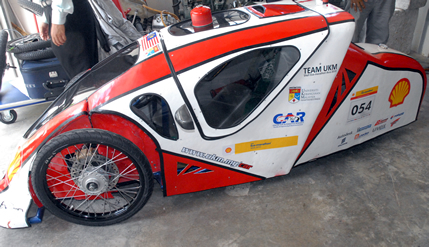 UKMCAR2 was driven by Muhammad bin Abdul Halim and Yovaraj a/l Karunakaran. The Fuel Cell Vehicle Team from UTM won the fuel cell grand prize of US$1,000, trophy and certificate. Their prototype covered 598.8 km using one litre of fuel. ATE-1 from Thailand’s Army Transportation Engineering School won the overall prize covering 1521.9 km using one litre of fuel.